When your child is diagnosed with a brain tumour, they may be given radiotherapy as a treatment. This uses controlled and targeted doses of high energy beams of charged particles to destroy the tumour cells, whilst causing as little damage as possible to surrounding healthy cells. Will my child have radiotherapy? Not all children diagnosed with a brain tumour will be given radiotherapy. if your child's tumour cannot be operated on. after surgery to destroy any remaining tumour cells, and so lower the chances of the tumour returning. other factors e.g. whether the tumour is growing or causing symptoms. If your child is under three years old, it is unlikely that they will be given radiotherapy. Radiotherapy can be damaging to very young children, having a long-term impact on cognition, growth and hormone levels. However, some tumour types e.g. ependymoma, may be treated with radiotherapy in younger children, if the tumour is in the posterior fossa (the back of the skull). At all times the type and dose of radiation needed for treatment will be taken into account and the benefits of treatment will be weighed against any immediate or long-term risks. Radiotherapy may also be given alongside chemotherapy for some tumour types. The Brainy Bag is available to all children diagnosed with a brain tumour. Each bag is slightly different as it includes items appropriate to the age of the child. What happens when my child is given radiotherapy? Your child's radiotherapy treatment is very carefully planned by a team of medical specialists to ensure that it reaches as many tumour cells as possible, whilst avoiding as much healthy tissue as possible. First a 'radiotherapy planning scan' will be taken. This is usually a CT scan, but sometimes an MRI scan. The scan creates a 3D image of your child's tumour, showing its shape and location in the brain. This image and measurements from the scan allow more precise planning of where the radiotherapy needs to be targeted, the dose required and how often it needs to be given. All efforts will be made to avoid areas of the brain where irradiation (giving radiotherapy) may lead to long-term problems. These areas include the brain stem (responsible for functions such as breathing and heart rate); the optic nerve (which helps you see); the hormone producing area; and the cochlear in the ear (to reduce longterm hearing loss). It is important that your child lies very still during treatment, so that the radiotherapy is directed to the correct part of the brain. To help your child stay still, a treatment mask is made specifically to fit your child's face and head. This mask fixes to the treatment couch to keep their head still and in the same place each time they have treatment. There are different types of masks, made from different materials. They are made by smoothing the warmed material onto your child's face, so that the final mask is an exact replication of the size and shape of their head. Gaps are left for the eyes, nose and mouth, so your child is always able to breathe easily. A play therapist may work with your child to make wearing the mask less daunting. They can also arrange for your child to look at a radiotherapy machine before their treatment so that they are mentally prepared when they begin treatment. 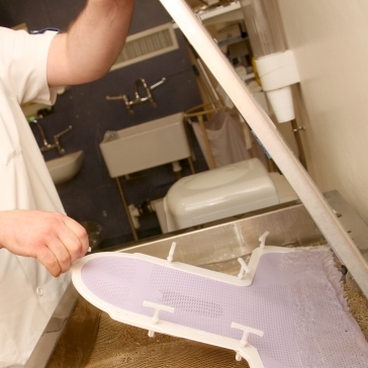 Thermoplastic radiotherapy mask being made (there are other types of masks). Cambridge University Hospitals NHS Foundation Trust. Your child's treatment is planned to suit their individual needs, so may be very different to the treatment of other children you may meet. If your child is very young or extremely anxious and won't keep still, a short general anaesthetic may be given. Or a health play specialist may work with your child to keep them calm and still. Medical staff will place the mask over your child's head and attach it to the bed, taking some time to position them. Before the radiotherapy machine is switched on, the staff will leave the room, but remain nearby. They will be able to see, hear and speak to your child, should they need them. Your child won't be able to see or feel the radiotherapy beams nor feel any heat from it. They will be able to hear the machine. Once the treatment session, called a 'fraction' is finished, medical staff will go back into the room, remove the mask and help your child off the bed. The medial staff will keep your child's mask until the next treatment session. Treatment times will vary, depending on your child's individual treatment plan. However, each treatment session (fraction) generally only lasts a few minutes. The treatment appointment will be considerably longer, due to the time taken to position your child in the correct place. If you child is having radiotherapy to their spine (known as craniospinal radiotherapy), this can also take longer. A typical radiotherapy plan is once a day, Monday to Friday, with a break at the weekends. It is common for your child to have radiotherapy for 4 to 6 weeks. Your child's health team can tell you your child's exact treatment plan. If your child is having radiotherapy as an outpatient, they will be able to go home after each session. If they need to remain in hospital for another treatment, a nurse will take them back to their ward. After the whole course of treatment, your child will have regular check-ups to monitor the effects of the radiotherapy on the tumour and any side-effects you child may get. It is likely they will experience some side-effects. Some of these will be temporary and gradually clear once the treatment has finished. Others may be long-term. What are the side-effects of radiotherapy? These will partly depend on the area of the brain where the radiotherapy is directed, and what that area controls. Also radiotherapy works best on rapidly dividing cells, such as tumour cells, but some normal cells in the treatment area also divide rapidly, so these areas tend to have the most common side-effects. These include hair and skin cells. Read more about the side-effects of radiotherapy. Will my child need to stay off school during treatment? It is highly likely that your child will need to take some time out of school during the course of their radiotherapy treatment. This may be due to tiredness, other side-effects or for daily trips to the hospital. The Brain Tumour Charity has produced some education resources to help them get the support they need to minimise the impact on their school/college work and keep up their friendships during treatment. No, your child won't be able to see or feel the radiotherapy beams and they won't feel any heat from it either. They will hear the machine though. It may be helpful to talk about this with your child before they have treatment so that they know to expect it and are not afraid. The Brain Tumour Charity animation about radiotherapy for children includes a sample of the noise. A health play specialist can also help your child become used to the sounds of the machine. There have been some cases where children have said they have been aware of a strange smell during radiotherapy. Will my child be radioactive after treatment? No. The radiation comes from the machine and will not stay inside your child's body. Once they leave the hospital it is safe for them to be around other people, including their brothers and sisters and other children. Why are children under three years old not usually given radiotherapy? If your child is under 3 years old, it is unlikely that they will be given radiotherapy. 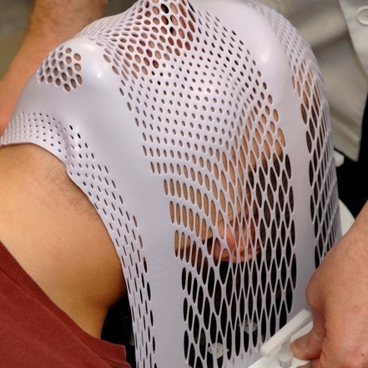 Radiotherapy affects some normal brain cells around and beyond the tumour. With adults many of these cells can recover, though they can still result in side-effects. However, the brains of children are still developing and those under 3 years still have much developing to do. Radiotherapy can interfere with this development, causing serious long-term side-effects - for example on cognitive development (thinking), physical development and/or hormone levels. Despite this, some tumour types e.g. ependymoma, may be treated with radiotherapy in younger children if the tumour is in the posterior fossa (the back of the skull cavity). If your child is under three and their health team recommend radiotherapy, make sure they talk through the reasons for this decision with you. Find out more about Radiotherapy for children in the full fact sheet - including more information about the longer-term effects and on resources to deal with hair loss. Find out more about Radiotherapy for children in the full fact sheet - Clear print version, designed to RNIB guidelines. Includes more information about the longer-term effects and on resources to deal with hair loss. Meet Jake, who can tell you all about radiotherapy for children. Dr Gillian Whitfield, Consultant Clinical Oncologist, The Christie, Manchester, talking at our National Paediatric Information Day.